Well, summers almost here so it seems like a good time to start gathering your recipes for the fresh veggies of summer. Wait… what’s that you say? Summer’s almost GONE?! Damn it, this happens every year. So what are you waiting for? Grab your shoes, keys and a $20 bill and get yourself to the nearest farmers market! There happens to be one in downtown Minneapolis about a block away from where I work, so every Thursday is a new culinary adventure. I absolutely love the farmer’s market; it reminds me of my Dad’s garden when I was growing up. Just a huge bounty of everything I could ever want: squash, cucumbers, green and red peppers, jalapenos, cilantro, sweet corn, asparagus, heirloom tomatoes, the list goes on and on. And then there are the fake vendors who, should be banned outright from ever stepping foot in a farmer’s market. You can identify them by the fact that their fruit comes in the same packaging you see in the super-markets, and they have produce which is ridiculously out of place for the season and geographic location (note to self: pineapples are not grown in Minnesota). I see no reason why my money should go to some schmuck who got a sweetheart deal from a produce distributor rather than the local farmers who have put in countless hours of backbreaking labor in order to bring their food to the market. Anyways, this week’s haul included a few bunches of basil, some garlic, yellow squash and bag of Wisconsin cheese curds which didn’t even make it back to the office with me, they were so squeaky fresh and delicious. 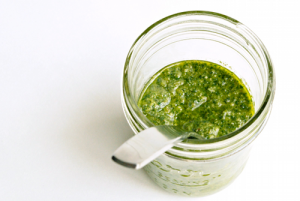 But for this post we’re going to focus on the basil and garlic because with those, and just 3 more ingredients, you can make a world class pesto. 3-5 cloves of garlic depending on your taste for it. Pack the basil into a food processor, along with the cheese, pine nuts and the garlic which you have peeled and quartered. Add good drizzle of the olive oil, and pulse it about 5 times with the processor. You could probably do this by hand, but who the hell has time for something like that? After pulsing, gradually add the remainder of the olive oil while keeping the processor running. Don’t puree the hell out of it though; it shouldn’t be a homogenous paste. Add a pinch of salt and a few grinds of pepper, and you’re done! 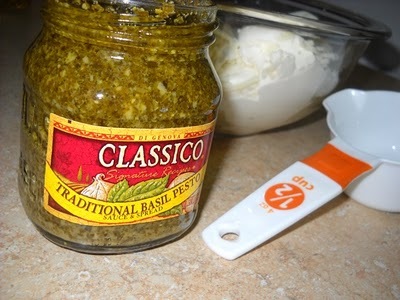 I guarantee that after one taste of this, you will never again buy store bought pesto. 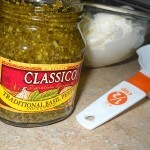 Transfer the pesto to a jar and pour a thin layer of olive oil over the top to prevent oxidation. Just a few suggestions for enjoying your pesto, because you will have a fair amount of it: mix it with fresh cooked pasta and any grilled meat or fish you like, spread it on slices of artisan bread and top with mozzarella before broiling, make a pan sauce with pesto, creams and white wine before adding sautéed mushrooms to go with chicken or pork chops, throw together some halved cherry tomatoes and small fresh mozzarella balls with farfalle pasta for a caprese pasta salad. Be creative with it! Nice post Loren! I was just at the Union Square farmers market here in New York. It’s awesome how much basil $2 will get you compared to at the grocery store! Have you played at all with reducing or not using pine nuts? They always seem really expensive to me and I’m not sure what it is that they add. In addition to freezing do either of you know about canning pesto? Does it work fine or mess with the fresh flavor? as for the pine nuts, I wouldn’t leave them out. I think they definitely add texture, and a certain je ne sais quoi (maybe umami?) which completes the sauce. I have heard of it made with walnuts too, but I’m not such a fan of walnuts so I haven’t tried it. I def agree with Mariel, I usually buy like half a pound of them at a time but I really love them. I would definitely avoid canning this; to me that would destroy it. Pesto seems like the ultimate summer condiment to me and it thrives with the abundant fresh flavor of basil and garlic. In the process of canning it those flavors would be turned down quite a bit, and that brilliant green color would turn a mottled green/brown. I think that may be the biggest problem with commerical pesto is that they have to boil it/cook it in some way to get it into stores. Thanks for the feedback everyone. Next up is a trio of recipes for Taco Night! I tried your recipe when a giant bag of fresh basil was dropped in my lap last week! Apparently my grocery store no longer carries bulk pine nuts either, so I made the walnut variety. The pesto went over really well on warm roasted-garlic bread at a party, though I did not follow your directions about the top layer of oil and got some oxidation. Thanks again for the recipe!